Shortly after I first started this blog, I made a tiny pair of sock earrings but I never wrote down the pattern. When the Whiplash theme was announced on Whip Up about a month ago, I decided to use that as the motivation to recreate my original earrings. I used the size 0000 double pointed needles again, and chose some variegated sock yarn left over from another project. I wanted my socks to match, so I spent quite some time trying to find two lengths of yarn where the color changes were identical. I won't even tell you how long that took, you wouldn't believe me. I knit these just like I do regular socks, beginning with the cuff. A few rounds of K1, P1 ribbing, the rest in stockinette stitch. The first round is really tricky, but after you get past that, the rest is pretty quick. Heel flap, picking up the gusset stitches. The only thing I did differently, really, is I gathered the toe instead of doing the Kitchener stitch, but I think next time I'll Kitchener it (is that a verb?) and not be lazy, I think it would look nicer. The sad thing is, I can't wear these earrings myself because one of my pierced ears healed back up (after decades!) and now I've gotten a little chicken with age. Maybe when my daughters decide they want to get their ears pierced, I'll go with them. Think they'll hold my hand? Aahhh! Those are really cute. And matching stripes too! What a wonderful project! They would also make great little Christmas stockings for a dollhouse. Your project is a winner in my book! 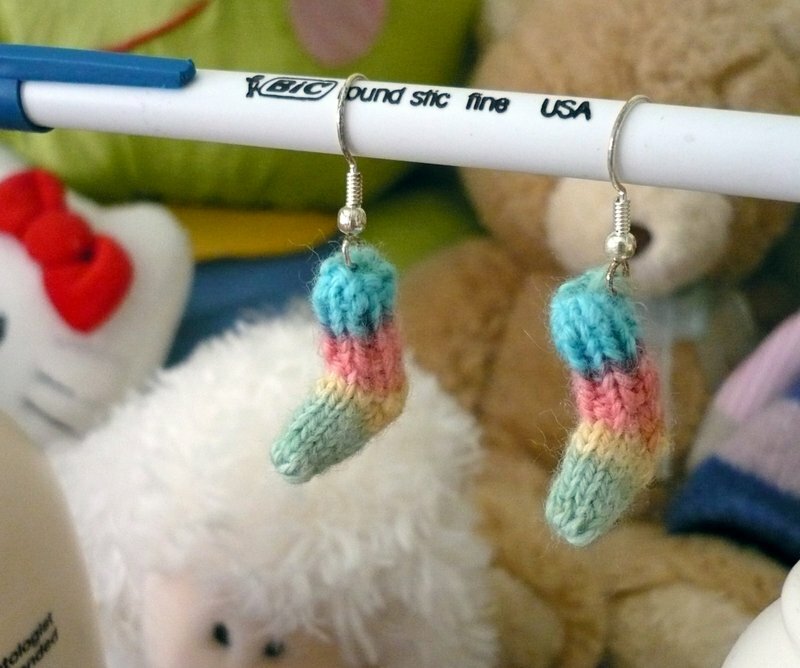 Hi--I love these minature socks!--would you be interested in a trade for one of my "inchie" brooches? of if not a trade--do you sell them? 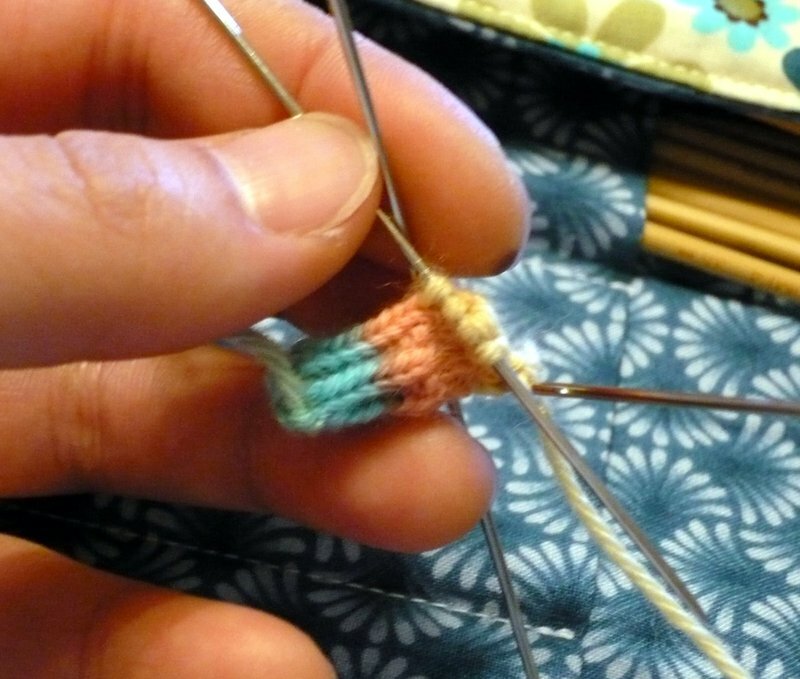 You and you're amazing micro-knitting! I'm looking forward to finding a spot for my teeny tiny hat again this year. So super cute and so super small! I haven't put earrings in my ears for a loooong time. Ever since I had my first kid, I guess. I think because they would try to pull them out. I'm afraid they are closed up by now.